1st. It snowed and I got to ride with Mom in the truck in the front seat while she plowed the parking lot this morning! Being the co-pilot is an important job. I have to watch my side of the truck to make sure she doesn't hit anything. I sit up nice and straight while she's plowing. I went inside where it was warm with Grandma while she shoveled the walks and put down ice melt. 2nd. We finally made enough room to bring 2 Moda collections out of the store room! Actually, Grandma & Mom moved all the fabric to make room while I supervised. It's a tough job supervising those 2 but someone has to do it. Since I don't have thumbs, I think it's a good job for me to do. Typing the newsletter & balancing on a moving chair is hard enough. I'm not going to move fabric, partly because Mom says no one wants dog slobber on their fabric. I was quite insulted when she said that! I only slobber after getting a drink because she doesn't give me a towel to wipe my muzzle. Anyway, back to the Moda collections. 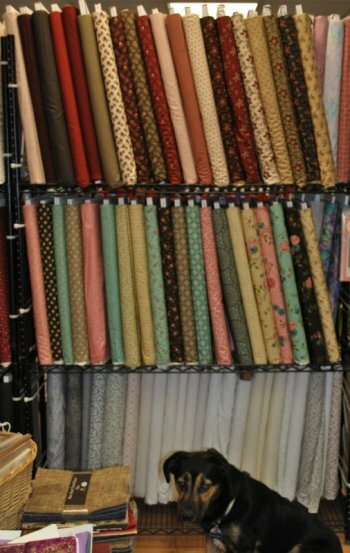 We have Richmond Reds and Rambling Rose collections. Both have some wonderful colors in them, according to Grandma. I don't see colors very well so I just take her word for it. Here's a photo of the 2 collections modeled by me, Obi the Wonder Dog! The bottom shelf will soon have Moda's Clara Garden Collection on it. Stop in soon to see these beautiful collections. Maybe the Clara Garden collection will be on the shelf, too. We have a Moda pattern to go with the Rambling Rose Collection. It's hanging right next to the fabric so you can see it!